If you need a strong serving utensil that can withstand the rigors of heavy commercial use, get the Winco LDCN-1 Stainless Steel 1 oz. One-Piece Ladle with Black Handle. 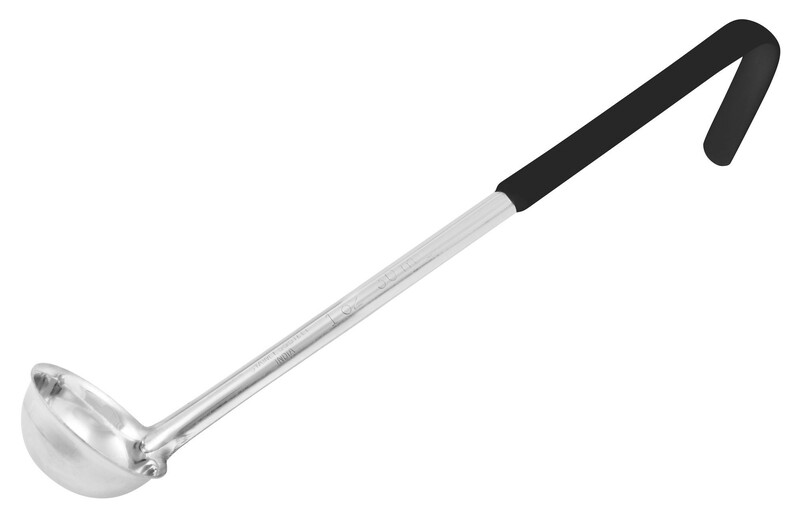 Manufactured from stainless steel, this ladle is rust-resistant and can be used in high temperatures without warping and bending out of shape. Designed with a deep bowl, it keeps liquids inside to minimize spillage while serving. Made with a plastic coated handle, this ladle is comfortable to use and its hooked edge allows you to rest it on the rim of the pot for easy access. In addition, its black handle makes it easy to identify when using a color-coded system to prevent cross-contamination.